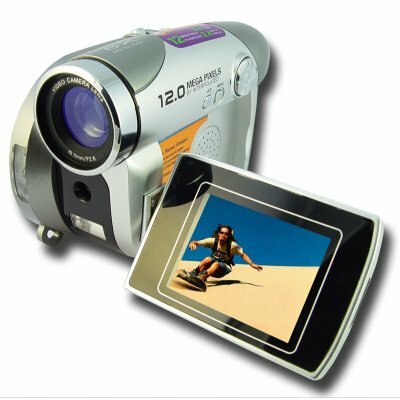 Successfully Added High Resolution Digital Camcorder + Camera - 2.4 Inch TFT Screen to your Shopping Cart. For taking high resolution Digital Movies or Digital Pictures for a minimal price, few can compare to the CVA-DVHC7010 Digital Camcorder. With a large flip-out 2.4 Inch TFT LCD Screen and smart button layout, this baby is easy to use straight out of the box. This well designed Camcorder is ready to be used immediately, with a removable and rechargeable Li-ion battery or your choice of x2 AA Batteries. Add to that the included 32MB of internal memory that can be expanded up to 2 GBs, and you have the opportunity to take hundreds of high quality photos and hours of video as soon as the action starts. Small, lightweight, very sturdy, and with an attractive and eye catching design, this Digital Camcorder is available as a single sample for testing or personal use, and is also available in bulk orders for big opportunities in the resale market. Another unique digital product offered to our loyal wholesale customers by the leader in factory direct Made in China products, Chinavasion Electronics.. If you wish to make comments or reviews about this product, login and use the product review box. Please open an inquiry ticket if you have questions regarding this item..